The iPod line was almost 5 years old when the iPod Shuffle debuted. The iPod Mini was Apple's first attempt to shrink the classic iPod into a smaller, lighter, more portable form factor. The Shuffle took that effort a step further. No longer just content with being portable, the iPod Shuffle was designed to be ultra-portable—a very small, very light iPod that would be ideal for runners and exercisers who wanted music without a lot of extra weight. From that perspective, the iPod Shuffle has been a great success. It outlived the iPod Mini and has become a common accessory for exercisers. It was also one of Apple's major playgrounds for experimentation. No Shuffle ever had a screen and one Shuffle didn't have any controls at all—it was just a flat, smooth piece of metal. Those experiments weren't always been successful (check out the third-generation model, for instance), but they were always interesting. Each item in this article spotlights a different iPod Shuffle to demonstrate how they changed and improved (or didn't) through the years. We begin by returning to 2005 and the debut of the first Shuffle. The First Generation iPod Shuffle was shaped like a small pack of gum. It was long and thin and had a cap at the bottom that could be removed to reveal a USB connector used for syncing music. This model was plugged directly into a computer's USB ports for syncing and didn't require the syncing cable that other iPods did. It was designed to be extremely lightweight and to be used in situations where weight is valued over features or a screen (which the Shuffle lacks), such as running or biking. This model was controlled using the buttons on the front, which were visually similar to the iPod Clickwheel. However, these buttons lacked that device's scrolling functionality. It offered two playback modes: straight through the music stored on it or shuffle. The Second Generation iPod Shuffle changed the shape of the Shuffle substantially. It was smaller and matchbook-sized, with just a wheel-shaped button on the face and a clip on the back. Unlike the previous model, this one did not have a USB connector. Instead, it synced with computers using a small dock attachment that connected the headphone jack of the Shuffle to a computer's USB port. The major changes in this model were its shape, its method of syncing, and support for some new audio file formats. 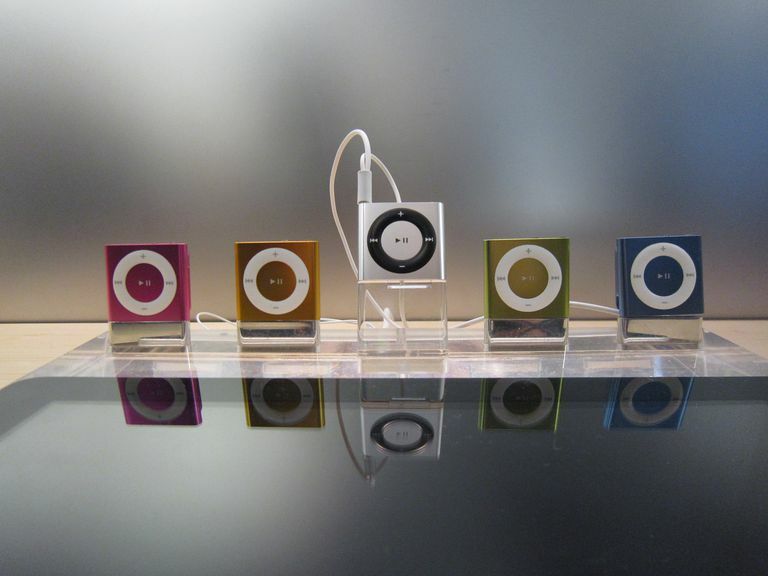 The 3rd generation model dramatically redesigned the iPod Shuffle, making the device even smaller, adding new features like VoiceOver, increasing capacity, and returning the device to a form factor similar to the first-generation Shuffle. In keeping with earlier models, this one did not have a screen. Unlike earlier models, though, the third-generation iPod Shuffle also lacked buttons on its face. Instead, the device was controlled by a remote control on the included earphones. Single, double, or triple clicks cause various actions, such as fast forward or play/pause. Third-party headphones could be used with the Shuffle with the additional purchase of a remote-control adapter. Its new VoiceOver feature allowed the iPod to read menu items to the user through the headphones in languages including English, French, German, Greek, Czech, Dutch, Italian, Japanese, Mandarin Chinese, Polish, Portuguese, Spanish, Swedish, and Turkish. The 4th Generation iPod Shuffle was something of a return to form, recalling the second-generation model and bringing buttons back to the face of the Shuffle. It was also the final version of the Shuffle, lasting for nearly 7 years before Apple discontinued the entire line. It was discontinued at the same time as the iPod nano. Both devices were casualties of declining sales caused by the rise of powerful, multifunction portable devices like the iPhone. Apple’s ultra-light, ultra-portable iPod, previous Shuffle models had buttons on the device’s face (1st and 2nd gen. models) or were controlled by a remote on the headphone cable (3rd generation). After criticism of the 3rd generation model, the 4th brought the buttons back. This model also added support for Genius Mixes and a hardware button for VoiceOver.